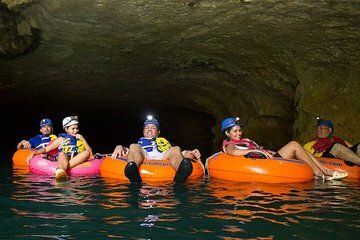 Ir a la tubería de cuevas y tirolesa en una activa excursión en tierra desde la ciudad de Belice que se adentra en la selva tropical de Belice. Flotarás a través de un sistema de cuevas subterráneas, volarás entre las copas de los árboles y visitarás una casa de mariposas para ver algunas de las criaturas más coloridas de la selva; combinar las actividades es una excelente manera de garantizar que pueda experimentar dos aventuras destacadas de Belice, incluso si tiene poco tiempo en el puerto. Las tarifas de entrada y las actividades incluidas no implican costes adicionales a la llegada. Pruebe la barbacoa de Belice en una parada para el almuerzo incluida. Viaja en un vehículo de clima controlado para mantenerte fresco y cómodo. My family of four enjoyed the cave tubing which was very relaxing and just the right length. They enjoyed the zip lining most so great memories made there! Our tour guide Joel was excellent and very knowledgeable about the jungle plants and animals. The zip lining was ok and was only a few zip lines, but fun non the less. The cave tubing was great and our guide was very helpful in showing us all the interesting points in the caves. The water was very clear and a great way to cool off in the jungle. I give this a five star rating due to our excellent guide. If you are looking for something different to do, see and experience this is perfect! The cave tubing was so much fun. Water was cool and crisp. Our guide had so much knowledge. It is quite a hike to the entrance so be prepared for that and to carry your gear. But it's worth it. I would actually give this a 3.5, but that wasn't an option. The tour guide was at the port immediately and it was easy to locate him, but after we found him, we sat for almost an hour before the bus left for the actual tubing area. Another couple that was on the tour with us had been there 45 minutes before that, so waited and hour and 45 minutes. Another family of 4 was suppose to have joined us, and we ended up waiting for them for that whole time. They never showed. I understand that we didn't want to just leave them, but a more specific time should probably been set and then if you don't show, we wait 15 minutes or something before leaving. It would have been nice to enjoy the area for that hour instead of sitting on a bus the whole time. The drive to the excursion was interesting. We were able to see the area on the hour drive and the tour guide told us some very interesting information about Belize. Once we got to the excursion, we were able to change in clean bathrooms and then hiked to where the caves were. That was fun. It was quite pretty and we had to wade through a shallow area of the river in 4 or 5 spots, which was kinda fun. The cave tubing itself was cool, and the guide told us some things about the caves, but when we got to lunch, we had to practically inhale our food so that we could zip line and get back to the ship on time. The zip line part of the excursion was rather disappointing compared to the experience we had the day before. It was also very rushed and I did not feel nearly as safe. There was one person on each platform and they would just say next and send you to the next platform. They did not stay with you and barely even talked to you. The equipment was wet and smelled bad. The area was very pretty, and the sights were nice, but the ziplining was very impersonal. It wasn't a bad excursion, but it wasn't amazing either.